A perfect addition to any hobby room, the cutting table provides a large stable work surface of 1.8m x 1m. The height helps reduce back fatigue caused by bending. With it’s four fold out doors positioned magnetically, the Cutting Table is much more stable than other fold down tables in the market. Utilising this fold down design, you are ensured a tidy work area whilst providing quick access to the storage drawers and shelves. 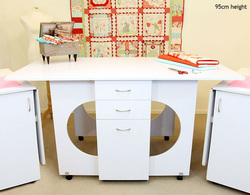 Not just for cutting, the large surface is ideal for preparation work and piecing with plenty of leg room when sitting. There may be variations in design of the support legs, depending on production, either half-moon or solid legs supplied as available.